Choose wine that fits the occasion. The process is quick and easy: simply start your wine and come back to bottle. We’ll take special care of everything in between so you can remain worry-free. Weddings are costly so making your own wine is a great way to actually save money. 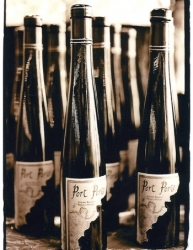 You will receive top quality at a fraction of the price of commercially produced wine from the liquor store. The best part is our prices do NOT inflate when the word “wedding” is mentioned. Bottling the wine can be an enjoyable experience in itself. A great way to involve your wedding party, family and friends; you can make your bottling appointment a fun and memorable event! Choose from a selection of elegant wedding-themed labels that are customizable to include any text you desire, in a variety of fonts. 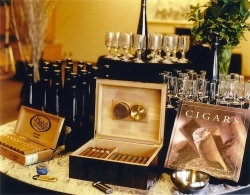 Your wine will look as good as it tastes and will compliment your wedding day. 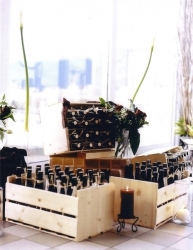 Please contact us at any time to discuss your wedding wine needs. 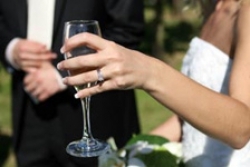 We look forward to the opportunity to help make your wedding beyond extraordinary. Well it’s been a few months and we had such a good time, we want to do it again. We’ll be putting on another few kits for a 10 year anniversary party?? Words can’t describe the quality of the red/white wine, the ice wine and the port that we brewed at Just Fine Wine. Our guests raved about them for weeks. From the wines that perfectly complemented the meal, the port that was served with cigars, and the ice wine that was sent home with the guests as gifts, we could not have been happier with every aspect of the brewing process…most especially getting to know you. Thank you very much for all of your help making our day truly special. Derek and I want to especially thank you for all your help with our wedding plans. With all your expertise on choosing the Sparkling White Merlot (a HUGE crowd pleaser!!! ), the popular Gewürztraminer & the tasty Sangiovese (also, both wines impressed all our guests, especially two Sommeliers!). Over the years, you have never failed in providing the upmost best service, knowledge, help and kindness. Also, as you well know, understanding and patience for our ever-constant tardiness. I blame Elaine!!! lol. Okay, maybe the kids… It is an honour to be one of your first reviews here on FB. Congrats on the tremendous success!